For hundreds of years, scientists, researchers, mathematicians, engineers, and workmen have used calipers to measure the distance between two points. In their simplest form, calipers are composed of two arms pointing inward. Those arms run against a long gateway which acts as a ruler to help you measure distance with considerable precision. Digital calipers are a combination of that centuries-old technology and the power of the digital age. The standard digital caliper, the Vernier Caliper, works with the same adjustable claw used by ancient calipers, but its measurements are digitally verified and fed to you on a liquid crystal display. The result is a least count, meaning the smallest value that can be measured by the device, of about 0.1mm. Vernier jaws are ideal for both internal and external measurements, plus they provide enough accuracy for the needs of most people. But some people need more accuracy than a Vernier Caliper can provide. For those individuals, there are micrometers. Like Vernier Calipers, micrometers are used for measuring. However, there are big differences in efficiency and use. For instance, a micrometer uses a screw gauge to help take measurements between a spindle and an anvil. This setup allows for considerable precision, which is why micrometers can offer a least count as small as 0.01mm. Sometimes you need precision within an inch, but other times, you need precision that undetectable to the naked eye. And when you’re in a production setting that demands need diametrical thickness to be measured over and over, you don’t want to rely on best judgement. Digital calipers excel because they remove guesswork and human error. Not only do they let you work with greater efficiency and accuracy, they save you time on reading measurements. In practical terms, that means you’re not left squinting to try and see where the measurement needs to be taken, relying on your best judgement for accuracy. And digital calipers aren’t only about accuracy, they’re about rapid measurement. When you have to set up a measurement each and every time you want to perform one, you can quickly end up spending considerable amounts of time and attention to a task that can be automated. 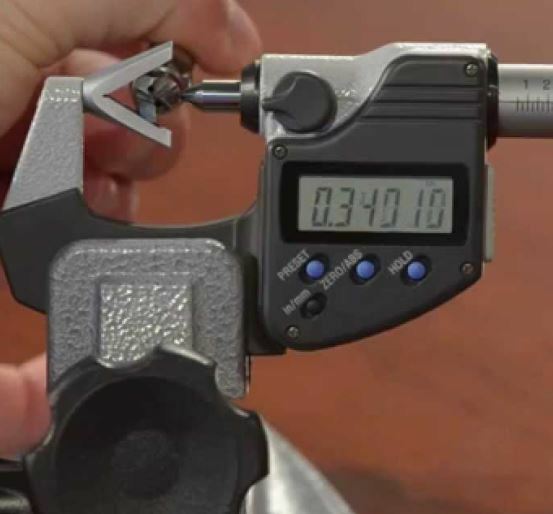 If you find yourself doing the same measuring tasks over and over, you want the process to be about as easy as pressing a button, which is what digital calipers can provide. Any Vernier Caliper worth its salt will do other things you can’t ordinarily do with a dial caliper. For instance, they should be able to help you establish a zero-point for your measurement anywhere along the length of the caliper. You won’t be prone to making the mistake of small but statistically significant differences between measurements, and you’ll be able to take quick and rapid measurements while sliding the claw to any point. Finding a great caliper isn’t just about choosing a solid build, but also choosing the right caliper for the task you’re doing. To begin, that means asking whether or not an instrument can provide enough precision for the tasks you have in mind. Accuracy almost goes without saying, but what’s less obvious is the importance of solid design, and equally solid construction materials. Poor design leads to slot-and-play when you’re trying to close the jaw of the caliper to a 0 setting. Minor design flaws can cause a tiny amount of wiggle-room in the caliper, which ultimately creates inaccurate measurements. 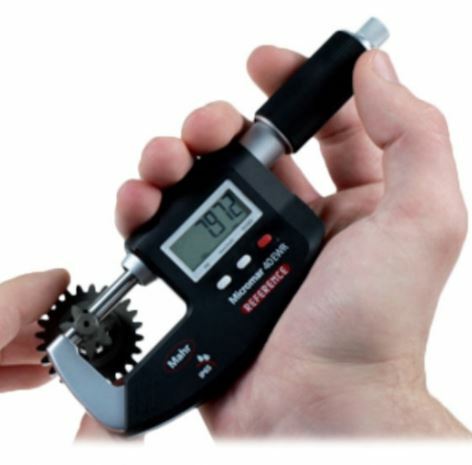 Poorly designed calipers are also susceptible to a “zero problem”, where you set the caliper to a new zero-point for measurement, and the display doesn’t reflect that change, or fluxes between thousandths of a point. Anyone who’s used a digital caliper before knows these are the telltale signs of debris on the faces of a caliper from taking repeated measurements. But when you go to clean off the debris and find you’re still getting errors, that means you’ve got a bad build or a product with a manufacturer’s defect. The quality of a caliper’s build is especially important for people who will be taking large quantities of measurements. As you press the face of the caliper up against another surface, the hundreds or thousands of resulting contacts can wear down the instrument. The result is inaccurate measurements and a device that’s effectively broken. Whether or not you’ll be satisfied with a cheap plastic build or you need something like hardened steel depends on how often you need to make measurements. Another thing you might want to consider are general purpose calipers versus special use calipers. When you’re working on special jobs, like measuring the inside of underwater drilling equipment, you’re not going to be well-served with a general purpose caliper. In special conditions, general purpose calipers will provide less accurate data, will be more inefficient to use, and will wear down more easily. In other words, the environment where the caliper is being applied matters. Most people won’t be doing their measurements in outdoor or underwater environments, but those who are should at least take the time to ensure their instrument is appropriately waterproof. Generally speaking, calipers made for tough workshop conditions should always have an ingress protection (IP) rating of 65 or higher. Another factor is quality control. 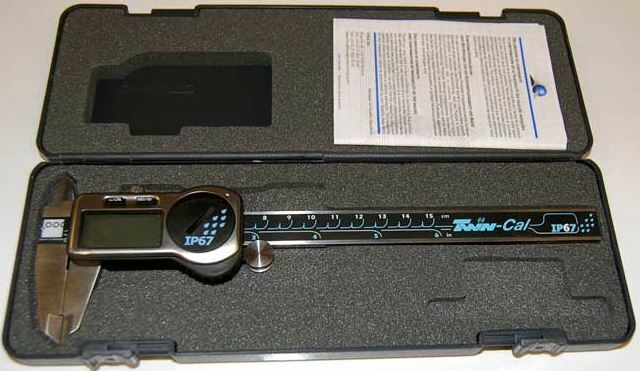 Many manufacturers of digital calipers want you to work for them as their own personal quality control staff. In other words, they don’t test their products before shipping them. The result is some defects inevitably get mailed out to the public, and buyers are left to sort out the mess on their own. Although the odds you’ll purchase a defective caliper from a respectable manufacturer are low, dealing with a device that ultimately proves to be defective is something nobody wants to deal with. Some caliper manufacturers will go as far as including an inspection report to ensure someone working at their factory personally checked the caliper you’re using to ensure it meets their standards. Short of an inspection, you don’t truly know if the caliper you’re purchasing is on par, or miles off base. That’s also a compelling reason to stay away from cheap knockoff brands when selecting a caliper. Some calipers have USB ports, or otherwise facilitate connections with desktop computers. Those devices are ideal for porting your measurements directly into your CAD program for prototyping, or directly into your spreadsheets with one click. If you’re doing that type of design work, data ports are an invaluable assed and time-saver. Other things to look out for are English/metric conversion buttons, data-locking buttons, and the type of battery that’s used. The last thing you want is for your caliper’s battery to die 9-months into use, only to discover the replacement battery is obscure and expensive. It’s easy to find dozens of different brands for digital calipers, and many of them are terrible. But you don’t have to become an expert on caliper brands to make an informed decision. One quick way to find out about a company is to ask if they specialize in what they’re doing, or if calipers are just one of thousands of products they make. Since its inception, Mahr Federal has specialized in production metrology, so you know their products are designed by seasoned experts. 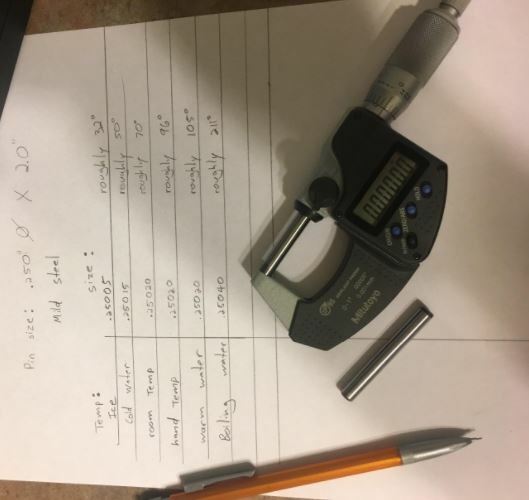 They know what real people need out of calipers, how to make efficient designs, and how to keep their accuracy held to the highest standards. And that’s exactly what they offer with their 16 ER model digital caliper. 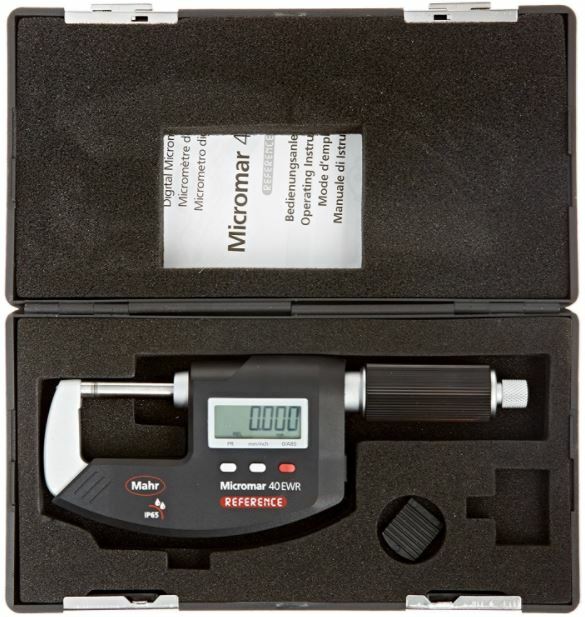 Its 6″ body makes use of the standard Vernier design, and boasts an extremely high accuracy rating of 0.01mm. The smooth lapped guideway has a locking screw conveniently placed on top, to ensure steady and reliable measurements. And dirt wipers have been integrated into the side for repeated measurement accuracy, which is the kind of minor touch calipers only have when manufactured by experts in the field. In terms of small conveniences, you may appreciate that your zero-position only needs to be set once. From there, you can store that point for all further measurements. Turn it on or off, you’ll still keep your saved zero position, which is thanks to the powerful CR2032 battery. On this device, the LOCK button is what sets your zero position, which makes it much easier to avoid the possibility of operating error. The beam and crossbeam of the 16ER are composed of a hardened stainless steel, which is structurally ready to keep the accuracy of your measurements time and time again. You won’t have to worry about the ends wearing down. Meanwhile, the plastic components are chemical resistant to help the caliper survive tough workshop conditions. The electrical components are protected with a sturdy IP67 rating, which is rated to survive even momentary submersion in water. The body of the device has a large LCD which is easy to read, and can be toggled between English and metric units with one button. As an added bonus, the 16ER includes a protective case and the necessary battery. One final thing to note is that although this is a six-inch caliper, the actual measuring range is 150mm, approximately 1/10th of an inch shorter than 6″. Brown & Sharpe is another brand that stands out for specifically creating instruments to help meet the most strenuous demands of manufacturers. 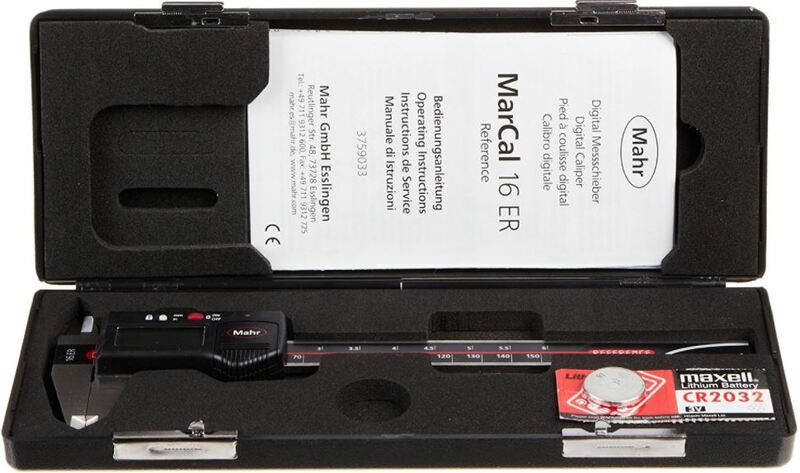 Their Twin-Cal digital caliper uses the standard Vernier 6-inch build, but the body of their device is actually considerably longer to ensure you can make use of the entire six inches for measurement. Like with Mahr’s ER16, this device is accurate to the a prestigious 0.0005″/0.01 mm resolution, and is ready to go for workshop conditions. Brown & Sharpe is calipers are manufactured in Sweden, and follow all standards laid out by the American National Standards Institute. But what makes this digital caliper really stand out is its use of a TESA wireless interface, along with a wired data port. Combined, these features allow you to export data to your computer to take measurements far faster than would otherwise be humanly possible. And for further convenience, you’ll find a USB port for even more options to connect. Sometimes you’re not taking your caliper out to an engine yard to get measurements off a dirty tailpipe. If you’re sitting in a lab taking measurements to feed digital data into a computer, measuring speed becomes more important. Twin-Cal’s measuring speed is faster than 2ms, so you’ll have a measurement taken before the mouse button you used to request the it is even finished clicking. The body is made of stainless steel which has been coasted with PVD for durability. For the electronics sealed behind plastic housing, and is protected with IP67 waterproofing for coolants, oils, dusts, and momentary submersion. The display of the device is clear and particularly large, so you’ll be able to check measurements from a glance, and from a short distance. This caliper is designed with a lengthy 9.8 x 3.8 x 1.1-inch body, and weighs a total of about 8 ounces. The 1.5″ jaw is good for holding objects securely while you’re making a measurement, and the absolute zero feature keeps your zero settings even when you turn the device off. Unfortunately, it doesn’t include a cable or wireless receiver to attach the device to a PC. But it does include a protective fitted plastic case, and the necessary CR2032 battery. Plenty of brands claim they provide precise measurements, but Mitutoyo is one that’s ready to provide it. As the name suggests, Mitutoyo is manufactured in Japan, and is kept to the high standards of Japanese manufacturing. 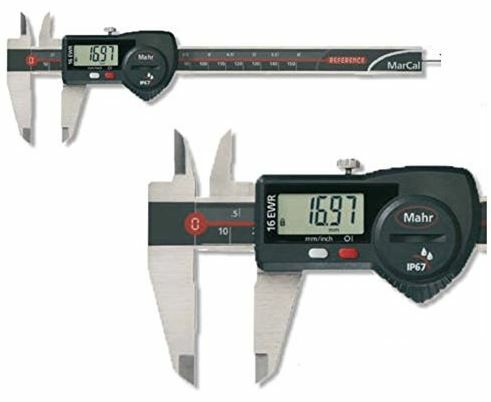 In the digital caliper industry, Mitutoyo is well known as the go-to brand for reliable quality. That’s partially because with Mitutoyo, you can be assured the caliper you receive won’t fail to meet the manufacturer’s specifications or otherwise be defective because every Mitutoyo caliper is tested in their factory. After being hand-tested by experts, the responsible staff members personally sign a certificate of inspection to be included with each caliper they sell. 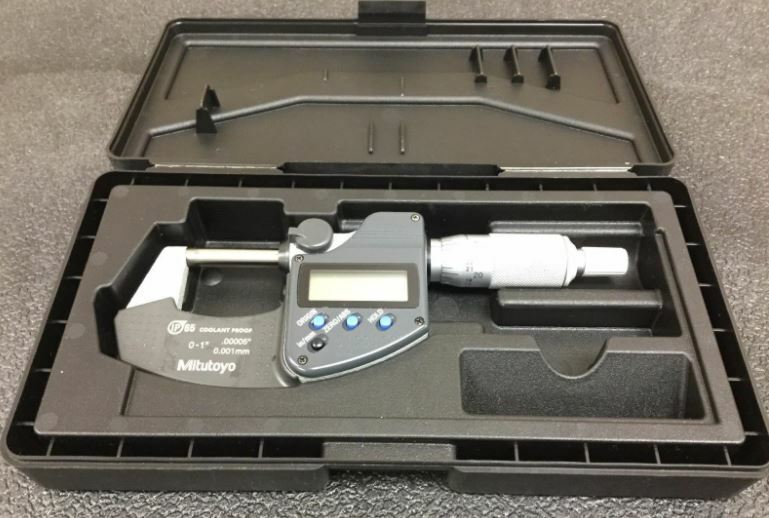 In terms of accuracy, Mitutoyo’s 293-340-30 is a micrometer with an impressive 0.001mm resolution. And true to their reputation, it has the sturdy build a digital caliper needs to hold up under regular use. The Mitutoyo 293-340-30 uses a simple LCD display that resembles the face of a standard calculator, which can be toggled between the imperial and metric system. The ratchet-stop design of this device allows you to apply uniform pressure for adjusting the caliper. In other words, you won’t just be able to make more precise measurements, but repeatable ones. All the plastic components involved are resistant to oil, and the measuring faces have been tipped with carbide for durability over hundreds of measurements. The IP65 protection is rated for being dust tight, though not submersion. You’ll be protected from a small spill, but don’t go taking measurements inside of a pool. The device weighs a hefty 12.8 ounces, and makes use of an auto shut-off feature to save battery life. Whether or not that feature will be a convenience or an annoyance depends on your intended use. Depending on how often you use it, you should find the battery will last through nearly 3 years of steady measurement. Another entry from Mahr Federal, this micrometer makes use of a spindle-and-anvil design rather than more standard Vernier Caliper build. The spindle and anvil are both made to last thanks to being carbide tipped to hold up under constant use. And the spinner ratchet has been smoothly integrated into the thimble of the device for easy use. The one-inch (25mm) measuring range should be more than enough for the kind of super-precise measurements this device is designed for. The 40EWR sports an impressive 0.001mm resolution, and an equally remarkable error limit of 2-7 micrometers, depending on the measuring range you’re using at the time. Like the Twin-Cal, this device is ready to port data to your computer, and includes a USB slot and integrated wireless support for that purpose. If you don’t have your own software setup for transfer, you’ll be able to use their MarConnect feature to transmit data directly into Windows programs like Excel. And like the Twin-Cal, this device has been built for rugged workshop conditions, and protected with waterproofing IP65 for oil dust and wetness. Like any solid digital measuring instrument should, this device uses the same essential lock/reference buttons to help you secure your own unique zero position, and prevent you from making avoidable operation errors. Like Mitutoyo’s caliper, this device uses an automatic on/off feature that will either be annoying or convenient, depending on your use. The extra-large digital LCD can be toggled between the imperial and metric systems, and supports incremental readings. A reasonably-strong IP65 protection ensures the device won’t die the first time a spill occurs, and the plastic components are resistant to chemicals. In addition to the battery, which is rated to last for two years, you’ll also receive a plastic form-fitting case for storage. For a lapped guideway caliper, you’re going to be selecting between the Mahr Federal 16ER and the Brown & Sharpe Twin-Cal. 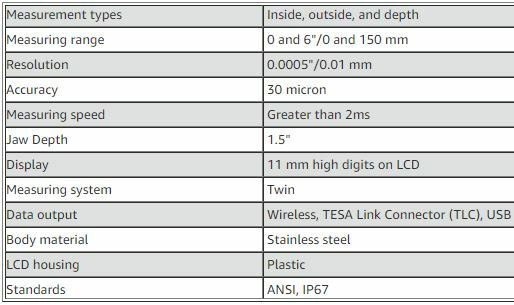 Both are highly accurate, and both have top quality build that includes IP67 protection. But only the Twin-Cal has the digital connectivity options you want to upload your data to a computer. On the other hand, if you could care less about connecting your caliper to a computer, you’ll be able to save by choosing the equally reliable 16ER. And if you’re looking for a micrometer with a ratchet-thimble configuration, then you’re going to be selecting between the Mitutoyo 293-340-30 and the Mahr Federal 40EWR. While both are built to the highest high standards, the Mitutoyo’s model boasts a moderately greater degree of precision. 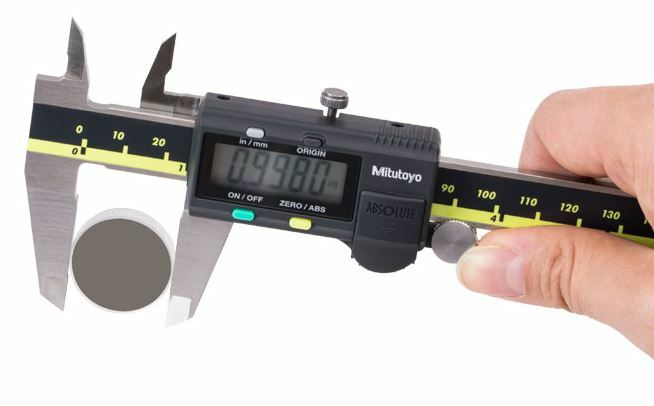 From a measuring range of about 200mm, Mitutoyo’s micrometer is accurate to a stunningly tiny 3 micrometers. The 40EWR is accurate to 7 micrometers for similar range. In other words, if you need outstanding precision, there’s no substitute for a Mitutoyo 293-340-30. But if you don’t need more than 7 micrometers of accuracy for your measurements, you’ll be perfectly satisfied with the price to performance ratio of Mahr Federal’s 40EWR.